Mr. Magazine.com - The Official Site of Samir "Mr. Magazine" Husni, Ph.D.
Searching for a little insight on the current magazine industry? Look no further. Through interviews, profiles and a few observations, you'll get my latest analysis on our ever-changing magazine world. 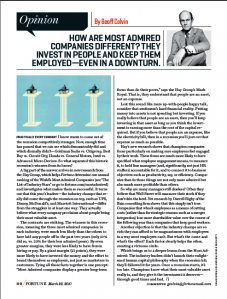 With deep roots in the past and new branches for the future, the new reinvented Fortune magazine gives a new, and positive, meaning for a blast from the past. Born in 1930 in the worst of economic times, Fortune magazine has reinvented itself 80 years later, also in the worst of economic times. (To the right is the new cover of the reinvented Fortune, and through the interview are sample pages from the magazine). Andy Serwer, Fortune’s managing editor wants the magazine to “start the conversation, again.” The new Fortune “wants to take the business issues of the day and be ahead of the curve,” he told me in The Mr. Magazine™ Interview. 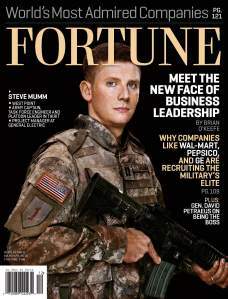 The new reinvented Fortune magazine, is the core of the Fortune enterprise, Mr. Serwer told me. The new Fortune reminded me so much of the original Fortune magazine, the Henry Luce’s Fortune of the 1930s and 1940s of the last decade. Delivering information through story telling, info-graphics, great photography and a hefty dose of the visual impact of print (that rare combination of typography and photography) all caught my attention and led to this interview with the man in charge of all these changes Andy Serwer. And now for the full, lightly edited, interview with Andy Serwer, Fortune magazine managing editor. SH: Fortune was launched in the worst of times, and from its very beginning, as a monthly magazine, it had a focus on customers who count rather than counting customers. With a cover price of $1, Fortune was an in-depth read and it answered the simple question, “What’s in it for me?” back then in 1930. How’s the new Fortune compared to the original Fortune of the 1930 that Henry Luce started? AS: It’s interesting in fact, Samir; we’re 80 years old as of February. We do have this incredible tradition. There are some things that remained constant and some things that changed a lot. I think really, fortunately, one thing that has still made us very differentiated and very relevant is our long-form journalism. We’re really proud of that—our narrative, deep-dive stories. We did that in the first issue of the magazine, in February 1930, and we’re doing it today. Readers know that’s what we stand for, that’s a part of our brand. That’s a constant. The rest of the magazine has changed a lot. It’s shorter, the departments are shorter, there are all kinds of photography, and especially information graphics now that are off the chart, pun intended. I think behind it, there’s a business intelligence that is also constant. And of course, all the tertiary parts of the magazine, or of the enterprise I should say, are completely different, which is to say the websites and conferences and all of that. As far as the magazine itself, I think the long-form has stayed the same, and the essential core IQ of the magazine is another constant. SH: One of the things I keep telling my students is that we’re no longer just in the information delivery business. We are more like experience makers. As I flip those old, old issues of Fortune, almost every issue had an experience that related to that audience and engaged that audience. As I look at some of the new designs, I look at some of the briefs–the info-graphics–it seems to me, its all designed to create an experience with the reader. How do you expect this is going to change where almost every magazine is now headed in that direction? AS: We never want to insult the intelligence of our readers. I think that you could argue that a strategy where you have to say, “Hey, this important” isn’t the best. I think that everything we do has a high journalism IQ, especially our longer pieces, and our shorter ones as well. We’re adding value by having the smartest people in the business work here and do journalism. I think often our great work speaks for itself, not that we don’t emphasize great display type and great points of entry all that we can. But, I think you can over label. SH: There was a lot of talk two years ago about the fate of business magazines, especially when Condé Nast launched Condé Nast Portfolio. Portfolio folded, Business Week was sold, Fortune is cutting its frequency and Forbes is in changing. You name it the troubles facing magazines, and they are all found in the business magazines. 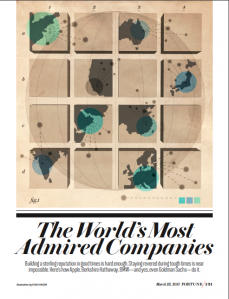 Is there a future for a business magazine in this day and age? AS: I think there is a future for business magazines in this day and age. Was there a future for four of them? The marketplace said no. There may not be a future for three of them. We’re certainly going to be one of them I can tell you that. One of the other magazines went from perfect bound to saddle stitch and they reduced their frequency without being up front about it. We like to say we’re a little more transparent than that. We tell people that and we’re not blind to the marketplace. We need to optimize our business model. We don’t just cover business, we’re practitioners as well. We’re not so arrogant as to ignore the marketplace. We understand that Fortune is a brand that is consumed across different platforms so obviously we’re exploring that. The magazine itself is the core of the enterprise. We’re in good shape here. The other ones are in not as good shape as we are. Our mission is clear. We have great people. We have an environment where I get phone calls from people at other publications who want to come work here. SH: Back in 1978 when Fortune changed to a bi-weekly magazine, people referred to the late ‘70s, early ‘80s as the “Golden Age” of magazines. 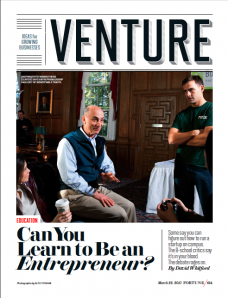 In this digital age, what are you doing to ensure a future for print, especially with Fortune magazine? AS: First of all, that “Golden Age” thing, I think it’s interesting you said that Samir, because people talked about the golden age of radio, the golden age of Hollywood, and both radio and especially Hollywood are as vibrant as ever. The ‘30s were a golden age in Hollywood, the ‘70s were a golden age in Hollywood and while you may not think that Avatar is a great, great film in the same way those classics were, it’s still doing okay. In other words, we can have a great new market for journalism, a digital marketplace that is essentially addictive. There’s never been more demand for business information, for news generally, than right now. An important point, Samir, is that the pie is getting a lot bigger. To me, by no means is it a foregone conclusion that magazines are not a part of that equation. They predicted the death of radio with television… Well, what am I doing? 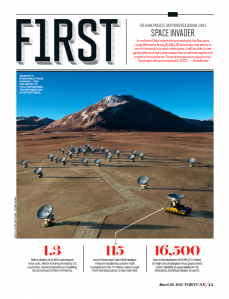 We decided to ensure the future of Fortune magazine by optimizing the frequency, and doing the magazine right. So, we’re investing in the physical properties of the magazine. We’re using better paper stock. Starting in this issue, we’ve invested in better paper that’s costing us more because we want the physical product to be better for our readers and for our advertisers. We’re rethinking our magazine to make it more relevant, more differentiated. There’s more utility in the front of the book. People said they wanted to know about careers and jobs; they wanted to know about entrepreneurism: we have two new departments to speak to that. They want to know about global business: we have a columnist, Michael Elliot from Time magazine that is going to address that. They want to know more about Washington and business: we have a “Washington Watch”, part of the front of the book that addresses that; we have a new columnist, Nina Houston, who is our Washington editor, who is addressing that. You have to commit to doing a magazine, listen to your customers, respond to your customers, but also get out ahead of them and create a first class publication and that’s what we’re doing. SH: Our most valuable player is our customer and one of the things that I really liked out of the sample of pages I saw was the fact that they had that flashbacks of the ‘30s and ‘40s that I used to see in Fortune as I flipped through those old copies. There was always this “meet and exceed” the expectation of the readers, in which the magazine is previewing the future and validating that information. How are you going to use digital to enhance that print experience? AS: I’d like to think that Fortune is going to be in sort of the vanguard of how a magazine can adapt to this new age. It’s pretty clear that magazines are going to be around for quite some time. I’m very excited about the iPad. I’ve used one, although to be honest, the magazine’s functionality is not at the fore of that particular product, but it will be and it will be that and others. Magazines are going to be around. You go to a train, you go to a swimming pool, you go to a living room, you go to someone’s country house, you go to someone’s office, you go to doctor’s office, there are magazines all over the place and there are people reading them all over the place. They’re not going to stop doing that, so the same kinds of things hold true today that held true four years ago, which is to say you want to be very creative and ahead of the curve. But also you really need to do things that you can’t find online and that’s a conscious part of what we’re doing now. It’s not commoditized. If it ever was commoditized, your magazine, it sure as hell better not be today. SH: That’s a very good point. What are the two or three things you have on your to-do list of the future? What do you expect from this reinvention of Fortune? What, at the end of the day, will someone say, “Andy, job well done, we’ve achieved our expectations.” What will that be? AS: We want to be part of the conversation. That’s the big thing, which is to say, people talk about the magazine, “Did you see the article in Fortune?” They have to be able to do that. We have to be able to be something that people discuss. We have to take the business issue of the day and get ahead of the curve. We have to look great. That’s another piece. We have to have some utility as well. I would say those are the three things. We have to be something that people say, “Aha! That’s something I could actually do, or use in my life.” I think those are sort of the three pieces. SH: What has been your biggest obstacle or biggest challenge in reinventing Fortune? AS: I would say speed. I’ve always wished we could work faster and faster. I’m someone who likes to work practically around the clock and fortunately, most of the people here work around the clock. We’re working at a tremendous pace, but it never seems to be fast enough to my liking. I always wish we could change things quicker and be more responsive and get out ahead even better. But sometimes you have to take some time and parts of the process will take a little bit longer than you want them to. SH: What was the easiest thing in reinvention of Fortune? AS: The easiest thing I think about reinventing the magazine was getting people here to buy into it. 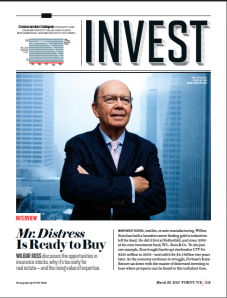 It’s really great having a staff of business journalists because when you have to do really tough things like downsize the magazine and change the frequency, you can explain it to them and they can say, “Listen, I was just looking at GE’s business, I understand. And looking at our business, we understand. We need to do those things.” And when you talk to them about reinventing the magazine and making it more appealing to a reader in 2010, and not being so 2005 anymore, I mean, then people will hear, “When do we start?” It’s been a great effort by everyone here. SH: Do you consider Andy the eternal optimist or do you think at some time in this business in the last few years you’ve felt some sense of pessimism? AS: I’m definitely a “glass is half full” kind of person. Someone called me a happy warrior one time. I don’t know about that, but to lead any organization, you’ve got to be optimistic to an extent, positive in a realistic way. I won’t lie to you, sometimes its tough. You have to be realistic about what you’re doing, understand the limitations, and really embrace change. If you don’t like change here in the print business, you will be out of business very soon.